It is not Muslim individuals that progressives welcome: they welcome the usefulness of the concept of Muslims as a hammer with which to attack traditional Christians. It is like watching someone who hates the mice in his house so much that he is filling the house with leopards in order to get rid of them. * And frankly, given the choice between living in the US as it would be if we had gotten eight years of Clinton, and living as a dhimmi in the US caliphate, I think I would prefer the latter. Okay. Are you in agreement with the article's author's idea of applying restrictions to Muslims just as we did to communists? No: didn't you see me saying I welcome Sharia law? 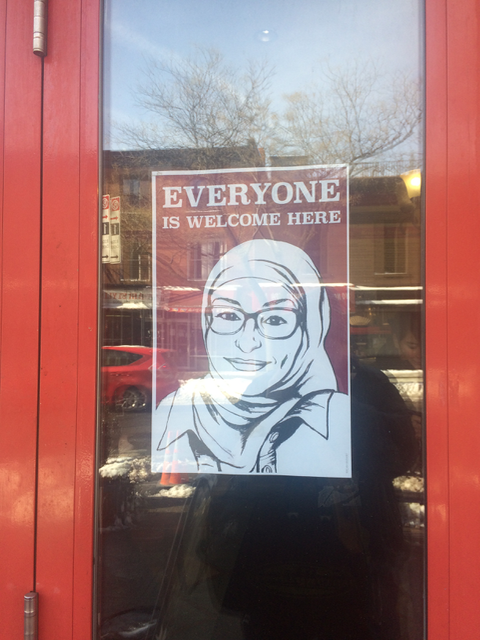 I'm curious how you know that the makers 0f the poster 'despise believing Muslims: to progressives, believing Muslims are "homohobic," "misogynist," "medieval," and so on'? As you clearly would be against smearing anyone who you suspect of disagreeing with you I am confident you must have some additional evidecne. Although my claim is, of course, a probabilistic one, i can assure you it easily falls within a 95% confidence interval. Progressives are filled with contempt for adherents of all traditional religions. "I'm curious as to how..."
·"That normals are subhumans whose role is to labor as serfs to subsidize the progressive elite and its clients." ·"Their sick faith gives meaning to these secular weirdos…"
That guy is not inhabiting this reality. This was published in the student campus' *newspaper*. I am guessing that you haven't been watching too much TV recently? Who do you think is burning, beating, and painting slogans such as 'Kill Whites' or 'WhiteLivesDontMatter' graffiti? Gene suggests that a post on a walk-in store is passive-aggressive progressive hate, and your response is about as obtuse as I have heard. Do you live in the States? Or watch TV? Or live on planet earth? Alright, Alex, yes, those people are defending the riots. But, insofar as there is an oogie boogie "left" out there, I'm skeptical. The Town Hall author's comments about enslavement, an elite, "normal people", and so forth, the idea that "progressives" in general viciously hate traditionalists, and so on fall into the same bucket as any hooha about cultural Marxism. @Samson: "That guy is not inhabiting this reality." The author of the link? "The Town Hall author's comments about enslavement, an elite, "normal people", and so forth, the idea that "progressives" in general viciously hate traditionalists, and so on fall into the same bucket as any hooha about cultural Marxism." Is this the bucket called "Facts Samson doesn't like to look in the eye"? Samson, I see this hate spilling out all the time in gentrified Brooklyn. The fact that you wish it weren't true does not make it false. No, it's the bucket labeled "conservative oogie boogies". I've been hearing this stuff for nearly a decade—that progressives are out to enslave people, that progressives are totalitarians, and so forth. It's stuff that belongs on one of Glenn Beck's chalkboards. I've seen the same stuff in online comments. I just think the implications are different. @Alex (posted 11:17) and Gene. Most of the progressives I know would (I think) just have seen that poster as meaning something like "I don't support discrimination against Muslims in immigration policy". While a bit wishy-washy given the current political reality this is actually not a bad sentiment. I was genuinely curious (OK: and a bit sarcastic) as to why it got Gene foaming at the mouth so much. I don't know any Brooklyn progressives - but the type he portrays would I think be an extreme and mostly unrepresentative fringe among the general population of left-leaning people in America. "While a bit wishy-washy given the current political reality this is actually not a bad sentiment." As a liberal (of the libertarian bent) why would you think that discrimination concerning those who are (statistically speaking) the least liberal people in the world be a bad thing? In some of the countries "the ban" applies to, support for Sharia law runs about 90%. Why would you want to flood the country with people who would like to make the US seriously anti-liberal? Hey rob, why were you coming all over yourself while making that last post? Ooh, my remark's pretty gross and uncalled for, huh? Since I really have no idea about your condition while posting it. Just like your comment about "foaming at the mouth." Well, Samson, when you have no actual argument to make, try name calling! Oh wait, you've done that already. Never mind. It's not much more of an insult than the bit about not looking reality in the eye (that's not a justification for it, only an explanation that it is rather benign). Do you think they'd be welcoming to someone wearing a MAGA hat? "A lot of the people who voted for Trump didn't know the Affordable Care Act was the same thing as Obama Care. Those are the type of people who shouldn't be allowed to reproduce." Just one of the gems I heard recently in my graduate school department. I have never seen an American progressive speak of Islamic philosophy and what they admire or appreciate about it. Never an interest in Arabic music or culture or you name it. It is the abstract idea of diversity and tolerance that they like, not the actual culture itself. Ironically enough, many American Christian apologists, such as William Lane Craig, used to study Islamic arguments for proving there is a God. Gene, could you please explain what would be so bad about living in a Hillary Clinton administration that you'd prefer to live in a Caliphate? I agree with you on abortion. But then why wouldn't you just say "And frankly, given the choice between living in the US as it is, and living as a dhimmi in the US caliphate, I think I would prefer the latter."? You made it sound as if Hillary would have done something so horrible that life in the U.S. would go from more bearable than the Caliphate to less bearable. Gene, I don't know about preferring Muslim to Clinton's eight years. For example; I have always wanted to live in a Mad Max: Beyond Thunderdome style universe, where I could be a man, woman (or both, neither, or one of the other 37 combinations of genders that the left is floating around) and heroically beat up Nazi's by making incorrect historical comparisons and by saying the words CHAOS and NAZI every ten minutes on anything I post on Twitter and Facebook. Who says that you have to get your feet dirty and risk your life to fight dangerous Nazi's? The Left has got the idea, here, clearly! Also, I believe that it would be vastly easier to be spiritually lazy by just virtue signaling any time that I felt the need to do something *actually* good! On top of it, I could justify my insanity by refusing to look reality in the eye - Samson clearly leads the way here! What's not to like? With the political violence and riots that Left organizes, participates, and advocates, we're almost there! On top of it, I could justify my insanity by refusing to look reality in the eye - Samson clearly leads the way here! Which of the things I have said am I "refusing to look in the eye"? Gene, you forget that the Islamic world is torn apart by sectarian differences. So the Caliphate of the US would be prone to a civil war at any point of time. "I have never seen an American progressive speak of Islamic philosophy and what they admire or appreciate about it. Never an interest in Arabic music or culture or you name it." Rumi is quite good, at least what I've been exposed to at my very progressive (UU) church.